This Pan Parag is described as being "exhilirating and refreshing; the perfect blend of fresh betelnuts, catechu, cardamom and lime", but it has been reported to be extremely "hot" and with a very intense flavor that "takes great effort." In India, the pleasant sensation is said to be worth the intensity of the chew. These packets are three times the size of the Orange label Parag packets. It's a stimulating euphorant and importation of this product for human consumption has now been banned due to its arecoline content. Legal? - Yes. Importable? - No. For this reason, we offer this product only as a curiosity for education and research, and strictly not for consumption. We are selling out of our present stock; once it is gone, we will no longer carry these at the shop. This Pan Parag is described as being "exhilirating and refreshing; the perfect blend of fresh betelnuts, catechu, cardamom and lime", but we found this one extremely "hot" and with a very intense flavor that took great effort. The pleasant sensation is worth the intensity of the chew, but it takes a strong will to handle this particular flavor. 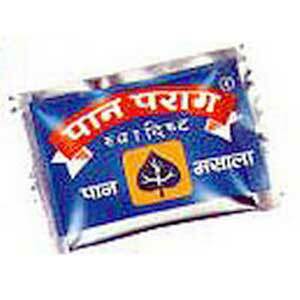 It is quite popular, though, and these packets are three times the size of the Orange label Parag packets. It's a stimulating euphorant and importation of this product for human consumption has now been banned due to its arecoline content. Legal? - Yes. Importable? - No. For this reason, we offer this product only as a curiosity for education and research, and strictly not for consumption. We are selling out of our present stock; once it is gone, we will no longer carry these at the shop.